Imagine living in a building that equally accommodates your requirements for a proper workspace and your need for a place to call home, without ever having to commute to an office again. Renowned Toronto photographer Matthew Wiley is no stranger to this type of live-work arrangement. In the late 1990s, he moved into his Sumach Street home, a former CBC commercial building that was converted into 116 live-work condominiums known as the Brewery Lofts. “I love this place,” says Wiley. “It gives me all the room I need to set up my specialty shoots—portraits, group photos and lifestyle images. The building is well-maintained, centrally located and accessible, with a nice mix of occupants ranging from artists to photographers to Bay Street executives.” Demand for units is unprecedented, Wiley notes, with condos now selling for over $1.5 million. Live-work spaces are not a new phenomenon. Butcher shops, bakeries and taverns with owners living upstairs have been around for centuries and still exist today in the form of ‘mom and pop’ convenience stores and B&Bs, allowing self-employed people to simply walk down the stairs to work every day. Today, with full-time jobs becoming increasingly scarce and telecommuting gaining in popularity, live-work is an appealing option for self-employed individuals searching for the ultimate work-life balance. The greatest demand for these spaces in the GTA and beyond is from professionals in the creative industries, as well as young entrepreneurs who are unable or unwilling to pay the high costs of buying or leasing office, workshop or studio space as well as additional living space. But the demand is there. Andrew Harrild, executive vice-president of property.ca, a real estate brokerage that specializes in Toronto lofts, sees a growing trend in buyers looking for a unique live-work space, especially if it has character and history. “It’s an attractive alternative to commercial space because you can finance a unit like this at residential rates and your taxes will be lower,” he says. 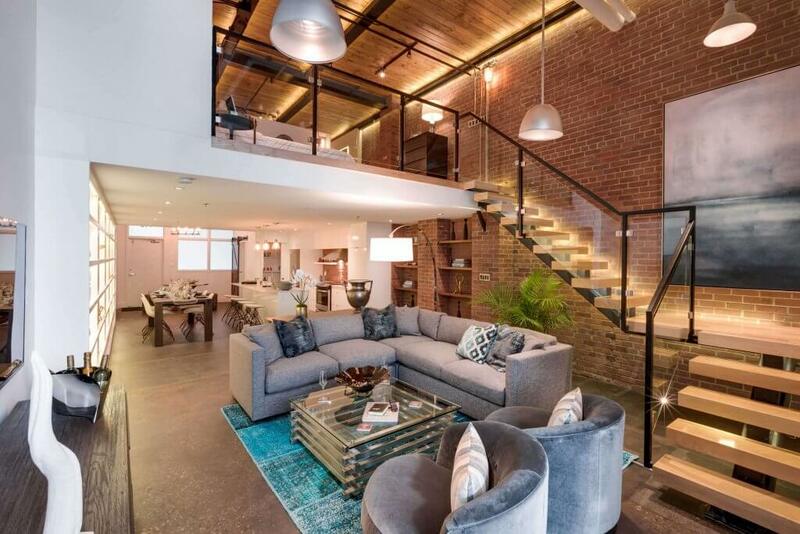 Accepting the challenges of building converted lofts in order to meet demand, Toronto’s Atria Development Corp. has recently re-launched its I-Zone Live Work Lofts with a limited number of 850 to 2,400 sq. ft. units. Located in a circa-1910 factory in the heart of Toronto’s trendy Leslieville neighbourhood, I-Zone was initally launched in 2002 with 104 retrofit condominiums. Concurring with realtor Andrew Harrild, however, Jain admits that traditional live-work loft conversions are difficult to produce in Toronto today, due primarily to the scarcity of commercial buildings. Consequently, some are opting to start from scratch and build new purpose-built “soft lofts” in existing neighbourhoods. Reflecting some of the character of traditional lofts, they are less costly to build and offer greater density. One such builder is Streetcar Developments Inc., which has carved a niche in the Toronto market for the past 15 years, with infill loft condo projects set among established neighbourhoods, primarily along the east end of Queen Street and The Beach. “Our specialty is building homes in vibrant neighbourhoods where people live and local businesses thrive,” says Alie Warren, Streetcar’s V.P. of Sales & Corporate Development, whose residential projects include live-work spaces. Current Streetcar projects, which have now expanded west along Queen Street, include multiple-building complexes incorporating residential spaces of different configurations and retail spaces fronting the street at grade. Several Ontario developers have successfully merged live-work spaces located outside of the urban core but within close proximity to transit and amenities. In Mississauga, FRAM Building Group completed a live-work project on a commercial stretch of Lakeshore Road in Port Credit. Live Work Residences is a collection of 18 brick warehouse-style town house units that offer a true live-work experience in the heart of a thriving retail area. Architectural features clearly delineate separate ground floor commercial spaces (with main street entranceways) from the living quarters above, which are entered via a quiet residential street behind the buildings. “This project has been well-received by the community,” says FRAM President Frank Giannone. Award-winning and often copied, its bold architecture has transformed the character of Port Credit. Taking the live-work concept to another Port Credit location, as well as Collingwood and Wasaga Beach, Giannone admits that most, but not all, Ontario municipalities are open-minded about this type of project, with a resolve to define live-work buildings as they do commercial and residential properties in their zoning regulations. With its Port Credit project, FRAM needed to negotiate with the City of Mississauga to accommodate the parking needs of its tenants and their commercial parking requirements. “We had to place parking in other structures. Fortunately, there was room,” says Giannone, noting that live-work parking can be a bigger issue in more intensified locations. Another challenge was property taxes. At the beginning of the project, the municipality wanted to charge the (higher) commercial rate for both the commercial and residential portions of the town homes. After negotiations with FRAM, the City decided to levy the commercial rate for only the commercial square footage of each unit. Utility costs were another issue. Despite FRAM’s efforts, town home owners are required to pay (higher) commercial electricity rates for both the commercial and residential portions of their properties. On a more positive note, Giannone comments that many Live Work Residences owners are offsetting their higher taxes and utility costs by leasing their commercial spaces to retail tenants. Concord-based CountryWide Homes, meanwhile, has created Eldorado Village, an 89-unit development in Brampton, made up of traditional town homes mixed with over 20 live-work town units. Each of Eldorado unit’s ground-floor retail space ranges in size from 500 to 600 square feet, with the town homes above offering 1,900 to 2,200 square feet of space on two levels. Mariani gives full credit to the City of Brampton for actively promoting new developments that include a mix of living and live-work options, creating integrated communities that offer a desirable alternative to the typical city commute, connected via Züm Transit and close to Pearson Airport, Highways 410, 427 and 407, as well as GO Transit. Similar to FRAM’s live-work town homes, Hamilton developer Dawn Victoria Homes’ The Tannery is a collection of urban-inspired buildings housing retail spaces on the main floor and town home condominiums above, reminiscent of traditional Ontario commercial/residential stone and brick buildings. Located in the city’s historic Waterdown community against the backdrop of the Niagara Escarpment, with views of a creek and waterfall, The Tannery offers shopping, restaurants, boutiques, spas and a even a theatre—all in close proximity to a GO station, Highway 403 and the QEW. According to The Tannery’s agent Tom Parsons of Sutton Group Quantum Realty, the ground floor commercial spaces and upper residential townhouse condos are being sold separately, as is the case in another Dawn Victoria Homes project, Village West on Plains Road. “The Tannery’s residential towns are 1,420 square feet, two-bedroom/two-bath units with kitchen, living and dining rooms on the first floor, bedrooms on the second and a walkout from the third level onto a rooftop mezzanine,” says Parsons, noting that all residential units are now sold. “These sold quickly for $400,000 to $440,000. The 1,000-square-foot commercial spaces are still available, ranging from $420,000 to $440,000. At least one residential purchaser is interested in a commercial unit, which would give them an ideal live-work space arrangement.” With traditional ‘jobs for life’ becoming a thing of the past and prices of residential and commercial spaces in the GTA out of reach for many, some developers are offering attractive and relatively affordable live-work options for entrepreneurs choosing to telecommute or set up a business in the urban core. At the same time, other developers are offering live-work spaces in suburban communities, promising an appealing lifestyle outside of the city to self-employed individuals searching for the ultimate work-life balance.